200m2 has built a special display housing to showcase ‘Princess’, the world’s first narrow gauge steam engine. Princess is returning to London for the first time in 150 years and will go on display not far from where she was built by George England & Co at their Hatcham Iron Works in New Cross. 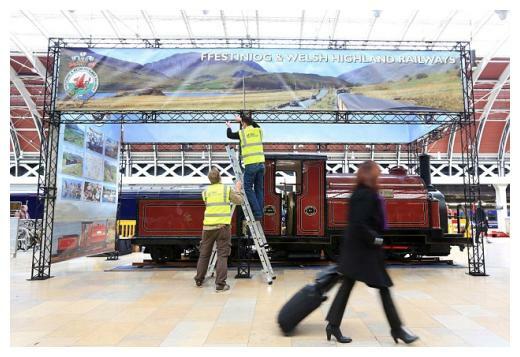 The world famous locomotive will be displayed at London’s Paddington station to mark her 150th anniversary. The steam train has been painstakingly restored by the craftsmen at Ffestiniog Railway in North Wales and will be unveiled to the public on St David’s Day – Friday the 1st of March. For her return to London, the Ffestiniog railway commissioned 200m2 to design and build a temporary structure around Princess to showcase this marvel of 18th century engineering. After supplying detailed CAD drawings of the concept, 200m2 built a structure around Princess using its TRUSSwire gantry system. High quality exhibition panel displays were then produced to hang from the structure to create a visual presence befitting a 150th birthday. To find out more about our exhibition stands call us on +44 20 3332 0092. Previous Previous post: Are exhibitions growing or shrinking in the present economic climate? Next Next post: Stage Design Made Easy!